Sea Ice News #23, plus a bonus NOAA sea ice blunder | Watts Up With That? NOTE: This post has several images, including two animations. Those on slower connections, please be patient while they load. While the vagaries of wind and weather can still produce an about-face, indications are that the 2010 Arctic sea ice melt season may have turned the corner, earlier than last year. 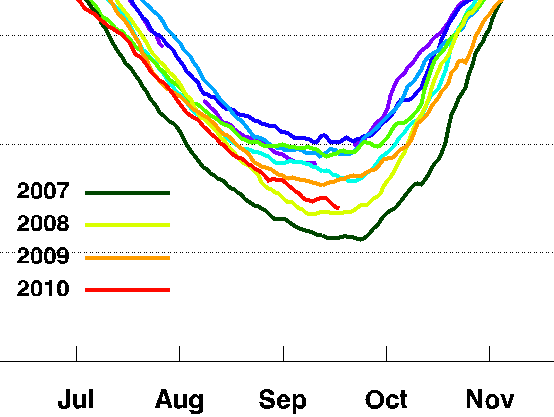 The Arctic sea ice cover appears to have reached its minimum extent for the year. It was the third-lowest extent recorded since satellites began measuring minimum sea ice extent in 1979. This year’s minimum extent fell below the 2009 minimum extent and above the minimum extents in 2008 and 2007. Then defying even the experts, it started back down again. Here’s the most recent JAXA data, including the preliminary Sept 19th data, which will be updated again at 8AM PST Sept 20th. The strongest vectors of the wind driven displacement are where the NAVY PIPS thickness plot show the greatest areas of thickness, Northern Canada near Ellesmere Island and Northern Greenland. While the graphic overlay I made is not a perfect match, it is very close. 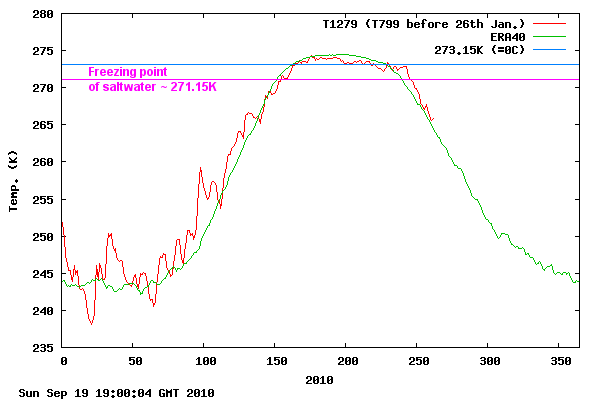 Since in the first temperature graphic from DMI, it is clear that average temperatures at 80°N and above are well below the freezing point of saltwater/seawater, which is approximately 271.15 kelvin (-2°C) See the line I’ve added below in magenta. It suggests that like in 2007, wind is a more significant factor in sea ice depletion than from melting, especially this past week where the DMI temperature drop shows well below freezing point of sea ice temperature at 80°N and above. If you want more detail, a full sized Video animation is available here as a flash video or here as an AVI file (highest quality 7.3 MB) A hat tip to WUWT commenter Bill and to Thomas Homer-Dixon for this video. What is interesting about this video is that you can watch sea ice being flushed out of the Arctic sea and pushed along Greenland’s east coast, where it then finds its way into warmer waters and melts. Also note how in the lower right, in the Beaufort sea, older multiyear ice gets fractured and broken up as winds and currents stress it. 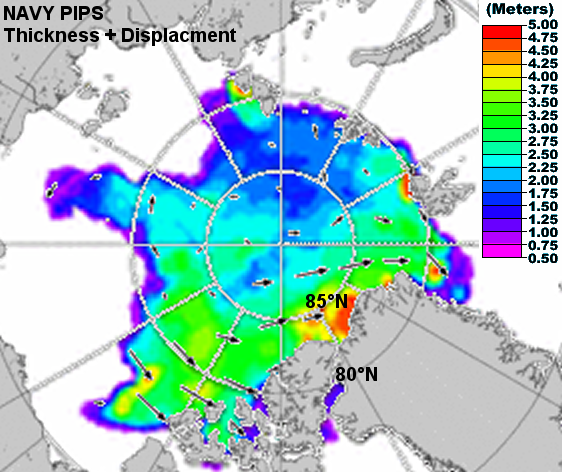 While indeed we can watch some of the Arctic sea “melt in place” during this animation in the fall of 2007, we can also see that winds and currents are a significant contributor to breaking up the sea ice and transporting it to warmer latitudes. I’m hoping JAXA will produce a similar video for the 2010 melt season. UPDATE: Ron de Haan reports in comments this finding below. He says “sea ice has grown”. It sure looks like thickness has increased, doesn’t it? But now take a look at the following chart that compares September 1 ice to September 18 ice. Which would you prefer to be standing on? Don’t sweat the ice area statistics. The thickness is much greater today, and we could even say the volume is likely more. Arctic temperatures above 80°N have been colder this summer and September. The ice area will rebound quickly, of course. I projected a 5.75 million sq km min. for 2011 a couple weeks back. I’m sticking to it. Finally, WUWT readers may recall that earlier in the week, I caught NOAA saying that 2010 was the “second lowest extent on record” when it wasn’t, and with the help of Dr. Walt Meier of NSIDC got them to correct that blunder. 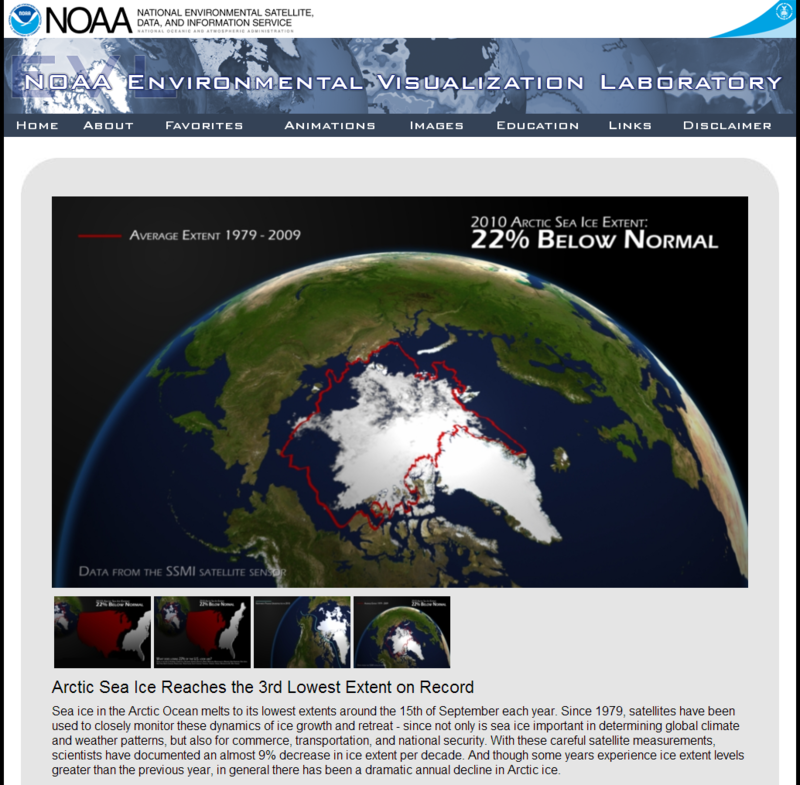 The screencap of the NOAA Environmental Visualization Laboratory also had another apparent error on it. 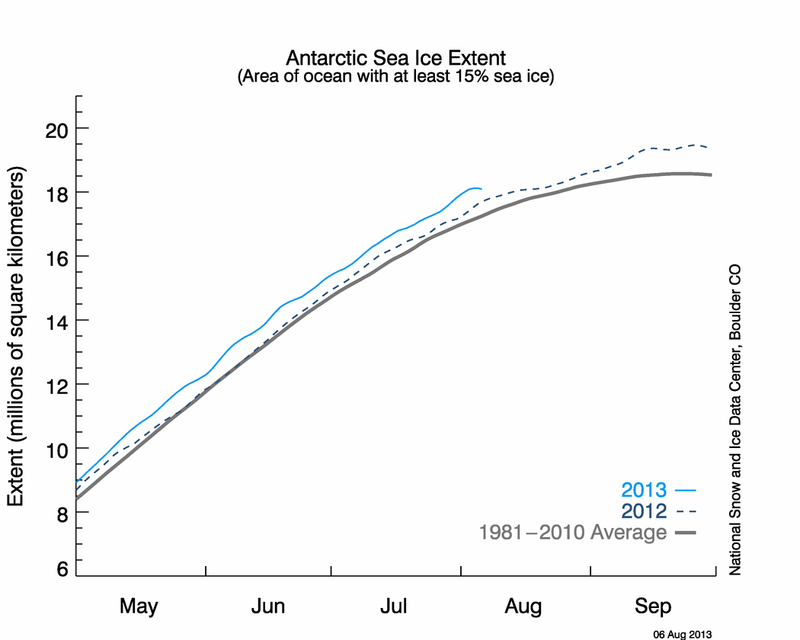 Note the ice depicted withing the red “Average Extent 1979-2009” line below. A number of WUWT readers pointed out that the presentation was biased and it appears that the ice edge was based on a 90% or greater extent, and not the 15% everyone else in the sea ice business uses. I fired off another letter to Walt Meier on the issue, but I never heard anything concrete back from him on the issue. But, it appears the message got through one way or another. Notice anything different? Here’s the blink comparator of the before and after sea ice extent visualization image. NOTE: You may have to click on it if not blinking in your browser. Looks like somebody at NOAA had to fess up to the fact that what they were presenting earlier in the week was grossly biased in the way it presented Arctic sea ice extent, making it look like there was far less ice than there actually is. Again I ask, why is it us bloggers and members of the public are the ones that have to keep pointing these things out? Maybe we should be the ones getting compensated for our time. To the credit of the NOAA Vizualation Lab, they fixed the problems we pointed out to them, and reasonably quickly. My thanks to Dr. Walt Meier of NSIDC for his help. Compare the response this week to that of Dr. Mike Mann with his still inverted Tiljander proxies and stations with messed up latitude and longitude that are still in his supplemental data years later, after numerous people have pointed it out. 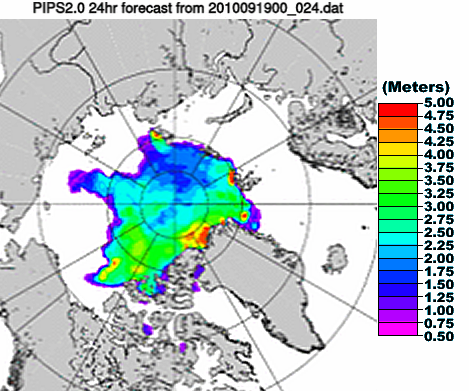 September 19, 2010 in Sea Ice News. How do we know it is 22% below average. Well, we don’t know because nobody knows what the sea ice extent average is for September 15th from 1979 to 2009. Jaxa shows it is currently lower than the 2003 to 2009 average but that is all we can say. (I might also add that many pro-AGW scientists are not very good at basic math and I have seen this time and again). Lisa Jackson, don’t mess with Texas! Over the past two years I have learned that ice on the Arctic Ocean is greatest in about March and least in about September. The minimum seems to vary a bit more than the maximum. Winds, ocean currents, and temperature vary from year to year and so does the ice. It may take several years for a major loss to be replaced but a full basin can be rapidly depleted when winds and ocean currents break up the ice and flush it from the Arctic Ocean. The growth and decline of ice appears to have been happening much like this for a few hundred years and while the maximum ice amount is constrained by the size of the ocean the minimum can be assumed to be zero, however, unlikely that is. The North Pole being ice free is symbolic but of little interest otherwise as winds can force ice from the center of the Ocean. There is nothing in the historical record nor in current measurements to suggest the Arctic Ocean will actually reach zero ice or close to it, nor for how many days or weeks. There is nothing to suggest that it would not start to refreeze. There is no information to suggest a global catastrophe if it were mostly or completely ice free for a few days or weeks. A new glaciation would remove water from the oceans and store it on land in solid form. The Arctic Ocean level would drop. If there are studies about what this would mean for the Arctic region – I have not seen them. Archeological finds indicate a much warmer Arctic not too long ago. And nobody DEFINITELY knows what the sea ice extent average is for September 15th from….1879 through 1978. Or from, lets say, randomly, 1970 – 1978. Or from 2007 BC through 2007 AD LOL. How in the hell do they KNOW what “22% below average” really means? scientific argument and into NOAA press releases. The sky is falling. The sky is falling. The ice is melting. just why should we believe any of they numbers they are supplying? Seriously, they WANT the numbers to go, and down they will go. Previous data will be reanalyzed and the amount of ice cover in the past will increase. JAMSTEC video excellent. Thanks Anthony. I am in the process of moving to Texas; because, if you want to mess with Texas, it will be even more problematical because I’m there. Just remember all you collectivists, Texas was the only Republic to join the union (lower case intended). And you need Texas more than Texas needs you! …are reverse to the displacement direction shown in the PIPS map. That’s the distinction. The way the displacement vectors are going now, they are aiding the injection of ice into the transpolar drift, which pushes the ice southward to melt in warmer latitudes. Preliminary JAXA 15% Extent for 19th = 4822500, a minor loss of 8906 on yesterday. Sorry, that should say minor GAIN of 8906. Until somebody can jot down what the extent should be I don’t see any reason to wonder what it is. If anyone can explain why extent this time of year when little sunlight hits the surface, is important (you know, the albedo argument), again, watts the big deal? And if anyone thinks I’m going to care about the 1979-2009 average, get another think. That is a very short time frame and we really don’t know what it tells us. Not enough data. One interesting thing in the extent graphs – the rate of change going up or down (slope of the curves) is pretty consitant over time, the big difference being when in the year a particular extent value is reached. The timing is different every year, the max/min values are different every year, and except for outliers, the trend is what one would expect – because we don’t know what normal is. Any trend is as good as another. The only significant thing going on is in the sun. It’s disrupting the climate. People notice those things. I expect the folks in Washington are already putting the polish on the new solar disruption – so dangerous it’s even reversed global warming. That is going to need investigating. Measuring since 1979, are they? What are they confirming? Elections are near here in the USA. Bloodless takeover there could be. Climate gate hearings in the summer we may see. Time to get the facts straight. I agree we can just ignore this down-tick. It’s just wind, and some weather, and it really doesn’t mean anything. Uh, I am wondering though why the difference between PIPS and Cryosphere Today images, where PIPS has thick ice on the north side of Spitsbergen and C.T. has no ice? The Earth is not aware what day it is. It is absolutely silly to compare this day with last year on the same day. This kind of comparison within a weather driven chaotic, as well as oscillating and seasonal system has no meaning whatsoever. I much prefer the running three month average for all weather related data, if indeed you want to average it at all. IT is a question that could provoke a new Cold War as global warming opens up the possibility of exploiting vast new energy reserves: Who owns the Arctic? The US National Oceanic and Atmospheric Administration forecast that Arctic sea ice could disappear completely by 2030 in the summer months…. The Arctic basin is one huge ice machine that is flushed on a regular basis by wind and currents. Ice melt within the basin is seasonal and not significant. Best to look at and read them all. The Earth is not aware what day it is. It is absolutely silly to compare this day with last year on the same day. I get what you are saying in principle. But, taking issue here, the Earth very well might “know” when it has made a complete revolution around the Sun. So making annual comparisons is not completely meaningless. Dr Frederick A. Cook is believed to be the first person to discover the western flow in 1908. Several others had found the eastern flow before that. When the explorers tried to get to the pole from Greenland they would have several days where the ice drifted south more than they walked north. They then started leaving from Ellesmere Island and today most trips from North American side start from Ward Hunt Island. The return trip almost did them in. First, the AMSER-E sounder animation is awesome. Second, in the extent blink-comparison, the notation in the lower left corner changes from “Data from the NOAA-19 and DMSP satellites” (9/15/2010) to “Data from the SSMI satellite sensor” (9/18/2010). Is there significance to that notational change? Did the ice extent in the image change because they changed data sets? Illumination welcome. Dates and time are simply an arbitrary human concept. The earth doesn’t know or care about how we relate to events based upon the earth’s rotations. When and if we say, average of 1979-2000, it holds very little meaning. When we say, Sept 19 is the lowest ever for this year, what does that mean? Well, lots of things(none very important), but I’ll start with, we know the arctic ice has been lower in the past, in fact, we know its been significantly lower in the last century a couple of times. By the way, concluding that the Arctic ice extend within the Arctic basin is more influenced by wind and ocean currents rather than melting within the basin, it is a tricky sport to make any long term predictions about the minimum ice extend in September. Less risky is it to make predictions for the maximum ice extend in March before the ice breaks due to the Arctic summer. At the same time we have a very good explanation why critters like the polar bear, the seal and the walrus rather take a swim to reach the coasts of the Arctic Basin than being flushed out of their habitat to find themselves in an open ocean on a melting iceberg somewhere between Greenland and Iceland. So you see that those animals are a lot smarter than our alarmist environmentalists who screw the facts selling our political establishment and big oil a future of an ice free Arctic with easy access to the resources and year round navigational waters. It’s like selling the Eiffel Tower via a closed bidding to a bunch of scrap traders. The seller is a fraud and the bidders are plain stupid. I’ll restate Pamela’s point with this example. Wash. & Oregon get frequent air masses off of the Pacific. The source (SW, W, NW) direction helps determine the temperature while the duration may be a day to a few days. A series of cloudy days such as we have just had moderates the temperature. The local airport hit 61F early last evening and stayed there (+/-2) until 10:30 A.M. today. The current thought is that the clouds will be mostly gone by Monday evening and the night’s low will be about 37F. At higher elevations (mine is 2,240 feet) with clear sky our temps will drop rapidly. A comparison with the same date in any other year is of little use, which, I suppose is why an average is used. I’ll restate Pamela’s point with this example. You and Pamela have great points. My point is that there is a reason the 365-day year exists. But, that aside, I get what you are saying and certainly think the fact that the “average” rules the roost…is not representative of reality. Hence: CAGW conjecture. Their house of cards is based upon averages. R Gates shrieking chicken little style that the “CO2 levels have increased 40% since the 1700s” being a good example that comes to mind. Weather [and climate] represent many extremes and those extremes and peaks and crevasses are just what HAPPENS. And if we are smart…we will learn to adapt and deal with it. Another problem with the ice! There is a problem when comparing “maximum” of Ice Core data with current data (Maula Loa). When comparing average values of 400 years with values of the last 50 years can be seen that is false mathematically speaking, contradicting the sampling’s theory. So extent is meaningless unless it carries caveats on wind disruption! Here are figures for the area under the annual extent curve. The figure for 2010 is the area for the 12 months preceeding Sept 2010. From this you get an idea of how much ice for each year. I put in annual global T from GISS for interest. 04 & 06 do not correlate but others do (warmer year less ice). T for 2010 is still awaited. Were 04 & 06 affected by wind? Extent, however you measure it does not include thickness. Volume is what we really need. Volume is the mercury in the hemisphere thermometer. From the narrow perspective of wanting to see the fraudulent AGW campaign exposed, yes it’s good news. But from the broader perspective of the well-being of the human race, it could indicate (in conjunction with certain other observations) a reversal of global warming and therefore is not such good news, because (a) colder is worse for people than warmer, and (b) it suggests that the solar physicists predicting a severe cold period may be correct. When I’m tempted to chastise myself for having opinions on science, I reflect on the fact that many serious scientists seriously believe that a thirty year record of Arctic ice – covering a period of mostly warm PDO – could have global implications. When there are abundant reasons to believe that similar conditions prevailed as recently as the 1920’s, and that ice increased greatly after that well-reported big melt, I become downright smug. AGW science is a bit like the priestly science of ancient times. The pharaoh rewarded those who scientifically predicted or even aided the the Nile’s flooding. As for the odd bean-eating fellah who thought the Nile just flooded or dropped because stuff changes…he got no MSM time, and was totally out of the academic tenure loop. If the likes of Watts and McIntyre opened their yaps, they’d be cutting bullrushes for the rest of their days. UK Independent gets in on the act, Ice-free by 2030. The August coverage was the second lowest for Arctic sea ice since records began in 1979. 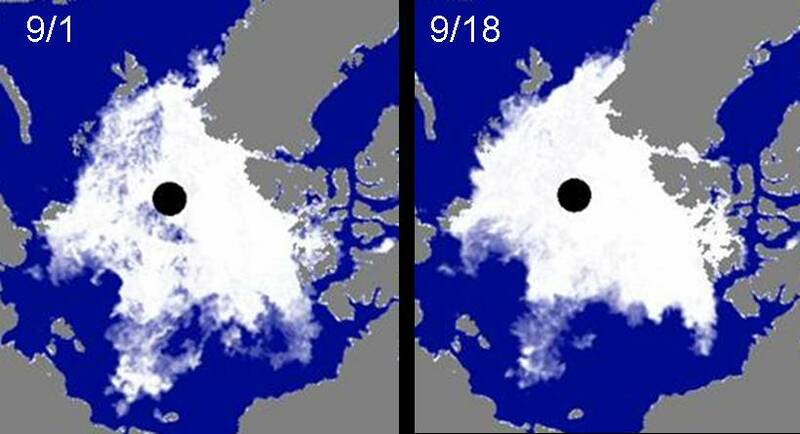 Only 2007 saw a smaller area of the northern sea covered in ice in August, NOAA said. Why is this good news? You predicted a recovery that was 1 million square km higher than current extent. With six weeks of cloudiness, low temperatures and the Beaufort Gyre reversing during the most important period of the melting season – during July and the first half of August, when melting rates are highest – you had everything you could wish for as a recovery-predicter, BUT STILL 2010’s extent is in a virtual tie with that of 2008. Realize that if the Arctic sea ice had experienced 2007 weather conditions, we’d be looking at an extent way below 4 million square km. You better start taking sea surface temperatures into consideration. This is the number 1 factor in ‘sea ice depletion’. It sure looks like thickness has increased, doesn’t it? No, it doesn’t. 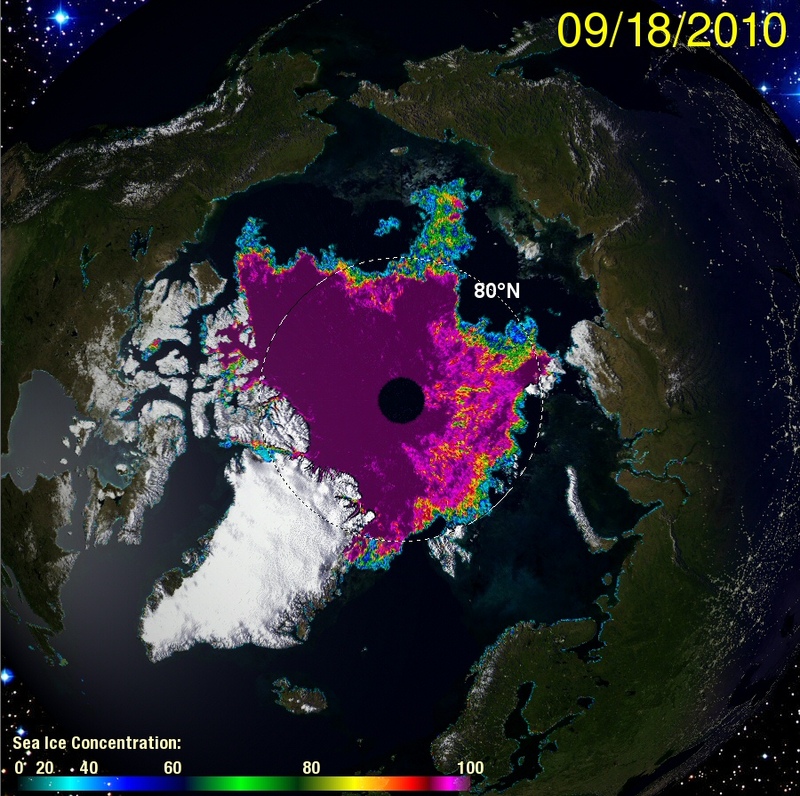 That’s a sea ice concentration map. All the holes in the central ice pack (which deserve a What’s Up With That article of their own, as we have witnessed something highly unusual this year) are freezing up. The ice is not 1 meter thick instantly. At the fringes there is still melt going on under the ice. Because of? You guessed right, anomalously high SSTs. The thickness is much greater today, and we could even say the volume is likely more. As no one can know this for sure until CryoSat-2 data starts coming in, there’s only one conclusion we can draw from this statement: wishful thinking. Not a reliable source if we want to know something about Arctic sea ice. There is no recovery (despite ideal conditions for it this melting season) and the ice is looking not so good. Trying to hide this fact and spin it the other way round, is intellectually dishonest. Ok, the ice pack looks more “solid” now as the leads and melt ponds have re-frozen. This is simply an indicator that the freeze season is beginning, and is typical at this time (around September 15-20, give or take). Within a few days we should see margins of new ice forming all around the current ice edge. It certainly has grown, as evidenced by anyone watching on the 367 band of Google Earth. It is growing in the wind-sheltered inlets between Greenland and Canada. In other places, the sea is past freezing and looks to be skinning over, like a pond ready to go solid. At this point, whatever losses there are statistically from wind below the 15% level are made up for with the new freezing in the wind-sheltered areas also below 15%. The new ice below the detection limit of 15% is significant. Minimum was the 15th of September. It has been fascinating to watch this process, and I reccomend it to anyone. There is no recovery (despite ideal conditions for it this melting season) and the ice is looking not so good. There never was an emergency 911 Ice Accident. That is intellectually dishonest, and the warmist camp made that call. It’s really cold, and sea ice is forming faster than the wind can push it out up there, as we speak. If that wasn’t enough, the Arctic SST’s are falling below freezing in an ever-expanding area, well out in front of the new ice areas. Nice try, but you would do better if you paid attention to the details. With six weeks of cloudiness, low temperatures and the Beaufort Gyre reversing during the most important period of the melting season – during July and the first half of August, when melting rates are highest – you had everything you could wish for as a recovery-predicter, BUT STILL 2010′s extent is in a virtual tie with that of 2008. I don’t see how both of the above statements can be true, yet I’ve seen multiple people saying one or both of them. Either this year was NOT ideal for recovery because of the high SSTs (as R. Gates kept saying), or SSTs are not the #1 force in melt. Personally, I’d think the former is true, and thus the El Nino had a big impact on the ice. The animation is fascinating. I think you could show that to a lot of laypeople and it dispels the image that the ice is just this giant mass of stuff that sits there eternally, unmoved, until recently disturbed by CO2. Nature is imagined to be fixed, in balance, undisturbed, but it is actually a continuous complex living movement. That animation says it all. 1. The 2007 “record” minimum was driven by tide and wind. 2. 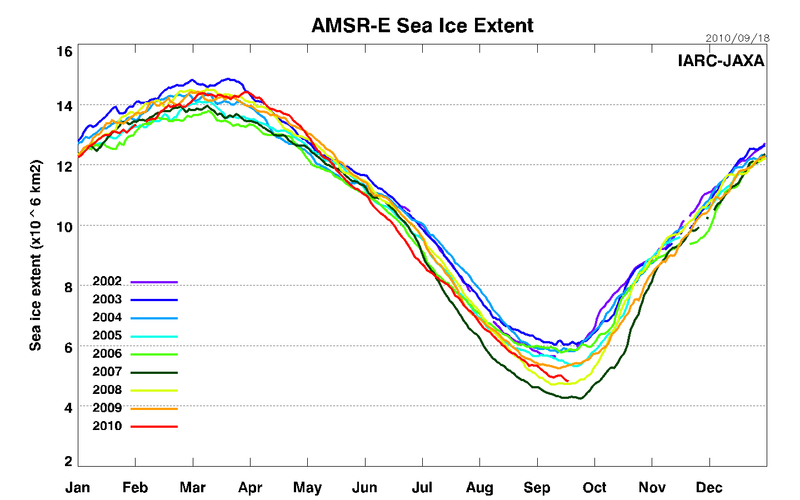 The ice has stabilised since then, not gone into a “death spiral”. 3. Do you know how long it takes the Arctic to “recover” from ice “loss”? Does any human? No. I don’t see how both of the above statements can be true, yet I’ve seen multiple people saying one or both of them. Either this year was NOT ideal for recovery because of the high SSTs (as R. Gates kept saying), or SSTs are not the #1 force in melt. Scott, you are right, I am contradicting myself. Barring the SSTs (which were higher than in 2008 and 2009, but not higher than in 2007), the absence of the Arctic Dipole Anomaly in July and the first half of August – bringing cloudiness, low temperatures and the stalling of the Beaufort Gyre and Transpolar Drift Stream -> spreading the ice out – is the main reason that 2010 is in a virtual tie for second place with 2008 ONLY. During July 2007 had an average daily melt of almost 40K higher than 2010, and 10K higher during the first 2 weeks of August. Had the stalling started only 2 weeks later, we’d be looking at a new record minimum extent right now. So I still venture to say that the most important period of the melting season was very much in favour of people who maintained there would be a recovery. Another factor in their favour was the shield of multi-year ice in the Western Arctic that got pushed there during the winter with its extremely negative AO, and took a long time to melt out (some of it is still left). But despite this 2010 is virtually tied with 2008, both Passages are open (the Russian and Norwegian crews are very close to exiting the NWP and thus circumnavigating the Arctic for the first time in human history), and we have seen some very weird behaviour in the central ice pack, with big holes all the way to the North Pole. These holes have lasted all the way till the end of the melting season, and instead of being closed by compaction they were frozen over in the last week or so. I would even be so bold to say minimum extent has been artificially high this year. The only remaining question now is: how about thickness/volume? Which model is more accurate, PIOMAS or PIPS? CryoSat-2 will hopefully tell us. I’ll conclude with one of R. Gates’ remarks (very clearly the person here with the broadest knowledge about and insight into the behaviour of the Arctic sea ice and its unmistakable downward trend): It will be interesting to see what happens in the next El Niño year, especially with a sun that is moving towards sunspot maximum. With an Arctic Dipole Anomaly that doesn’t disappear during July, chances of a new record minimum extent are very high. And if the ice isn’t as thick as some people are fervently hoping, an ice-free Arctic (ie below 1 million square km extent) can’t be ruled out either. And then hopefully we can start discussing potential consequences, instead of wasting energy in denying the obvious. speaks to the notion that same day comparisons are harbingers of some kind. Both sides of the debate will often put this kind of observation into their comments to add some kind of credence to their post or comment. It appears “human-normal” to do so, but the Earth knows no such day by day calendar system. If it rises above this line or dips below that line, it adds no meaning to the debate in terms of recovery or death spiral and makes it look like we think the Earth is aware of September [put in a date]. I have no doubt that if it does dip below 2008, AGW’ers will likely bring it to our attention in stating their case. But we use the same weak observation and statement to bring attention to our case. I know I sound like a broken record, but El Nino and La Nina phenomena were likely plagued by this same minutia in the beginning (I am only guessing here). Maybe it is the reason they went to the 3 month running average? Here in Thailand a doctor warned us all that polar bears will be extinct in less than ten years and all glaciers will melt. Is the label “average sea ice extent 1979-2009” meant to represent the average for this particular day of the year or is it meant to represent the average extent of all days over the entire period of 1979-2009? If the latter then it is a useless piece of information. Better we see the current days extent compared to the periods average extent for the corresponding day. I think that the wind & “arctic flush” factor increases greatly with thin ice. Maybe if the ice was thicker it would get jammed up slowing both the compaction & flushing. SST is very important in my book also..how could it not be? A big factor in SST is the surrounding air so Checking the Buoy air temps & a # of coastal landbased weather stations have given me a good Idea on how the Ice is doing..the wind factor has only tricked me a couple of times but compaction doesn’t remove ice it just moves it..Volume ice in the bank..we are going to see a good rebound. I propose a test of the ice free arctic theory. Let’s build a barrier between Greenland and Iceland to trap the ice flowing out of the basin, then see what happens to the extent numbers. Removing that pesky wind variable from the equation would certainly change the shape of those graphs! Does anyone know if Cryostat2 is making routine measurements, so that by this time next year, we will have an accurate comparison over twelve months? The average extent of all the days in a year would be a single yearly number — not much need for a graph there. Interesting article in the National Post. NASA scientists now claim ice melting rates are half of what was previously claimed. Revised JAXA number for yesterday in – 4841563 km^2…a decent gain. Looks like my speculation (near the end of the comments on Sea Ice #22) that the minimum was near was pretty accurate. However, yesterday showed the first loss in area for quite some time. Is that just noise, or does someone have an explanation for that? Could be that the holes have finally finished freezing up (as is visible on sea ice concentration maps from CT and Uni Bremen), so no more compensation for area loss due to compaction on the edges? Or the protrusion in the East Siberian Sea dissolving some more. The good doctor seems to be following Al Gore’s story boards and likely expects to be rewarded by NASA. Or, it could be he just isn’t very bright. Your letter of response was right on. …we know the arctic ice has been lower in the past, in fact, we know its been significantly lower in the last century a couple of times. I don’t know where you get the data showing lower in the last century. Any links? The minimum – so far – this autumn is 4.81 million sq km. OK, so that is better than 2008 (at 4.7m) but the average pre-2007 was 5.7 million. All the indications are that the ice continues to thin. Remember that thinning ice was one of the keys to the significant collapse in 2007 (caused by the ususual synoptics, but which on their own would not have had the same effect). Your prediction of 5.75m for 2011 sounds impressive until you realise that it would do no more than put us back to levels earlier this century. The normal minima in the last two decades of the 20th century were over 7.0 million. Given the accelerating rate of loss each melt season, for your 5.75m to be achieved we will need either an exceptional level of ice formation this winter or an extraordinarily low rate of melt next summer. I doubt you will see either. No real need. Ice moving out through the Fram Strait can be monitored by satellite. And this summer it seemed very little outflow occurred. It will be interesting to see what happens in the next El Niño year, especially with a sun that is moving towards sunspot maximum. Are you and R Gates saying that, every 11 years when there is a sunspot maximum, global temperatures increase significantly and Arctic ice extent dips noticeably? Is this seen in the temperature and Arctic ice records? Will the present weak solar cycle with a lower maximum be no exception? I see no evidence or logic behind this expectation – only wishful thinking. Confirmed JAXA 15% extent for Sept 19th: 4841563. A gain of 27969. 2002  5646875  Sep 09 (No Data 12-21). Sorry, very busy today. Lobe at 17oE still looks vulnerable, not yet convinced we won’t see further significant loss. Dr. Meier continues to impress with his rather classy demeanor. At least they did make the correction…but sometimes it seems like they try to get out as much biased garbage as possible hoping we won’t catch it all. Within 3 days it’s normally been dumbed down to erroneous sound bite form for the sheep to consume via the usual press outlets. Perhaps contrary to the statements at various conferences of late, they should focus LESS on PR and more on science. Way to be a stalker Smokey. Can’t handle the heat? Are we in a competition for drama queen? “Record minimum extent” translates as 1 maybe 2 clicks below where it is now. Could we get back to the language of science, please? No – bring it on! There is a link of 8 year pattern of temperature jumps, this cant really be stretched into 11. Solar cycles might affect climate but this is most likely over a longer timescale, no-one here except for R Gates argues for a global temperature rise at every 11 year sunspot maximum. This is a classic example of special pleading “if it wasnt for the weather we had in July, we would have had our death spiral…”. Just a little earlier R Gates was joking about Steve Goddard “he attributes the low minimum and September losses to wind patterns – but this too is just an energy phenomenon caused by global warming”. You cant have it both ways. Neither July nor September were “just weather”, it all has a cause and pattern. Neither side called it right since no-one really understands it sufficiently. It is you, not the month of July, that is stalling. Are you standing in for R Gates? There was a consistent meme on here last year and earlier (and still popping up a bit) that “it’s all the sun”. Spencer, Svensmark and other solar physicist types were the heroes of the day. Wonder what happened to that. And if the ice isn’t as thick as some people are fervently hoping, an ice-free Arctic (ie below 1 million square km extent) can’t be ruled out either. And then hopefully we can start discussing potential consequences, instead of wasting energy in denying the obvious. Are you fervently hoping an ‘ice-free’ Arctic will ‘prove’ AGW? The “sun meme” is still here, its just getting a little more nuanced, e.g. Paul Vaughan’s posts on SCL’. If only I could! R. Gates is a saint, and I hope from now on you will all bring some more attention and respect to the table when he’s talking. If that stops the AGW-is-a-hoax-disinformation, so we can finally all together start discussing what we can do to start transitioning to a healthier and more sustainable society, yes, I do. I also fervently hope no one here has a problem a priori with a more sustainable society. No – bring it on! Remember the PIOMAS vs PIPS controversy that was raised by ex-guest author Steven Goddard some time back? As it turns out the Sea Ice Outlook June prediction made by Jinlun Zhang – from the Polar Science Center of the University of Washington – that was based on the PIOMAS model turned out to be pretty accurate. Zhang/PIOMAS: 4.7 million square km, later revised to 4.8 million square km. Goddard/PIPS: 5.5 million square km (Goddard actually agreed with Anthony Watts that minimum extent would recover to 5.75 million square km, but never mind), later revised to 5.1 million square km. It’s 3500 km3 below the already rapidly decreasing trend line. Hopefully CryoSat-2 will prove the model wrong, or I don’t think we won’t be seeing any meaningful recovery in the Arctic for a while to come. Just like this year, but then worse. Correction: Hopefully CryoSat-2 will prove the model wrong, or I don’t think we will be seeing any meaningful recovery in the Arctic for a while to come. 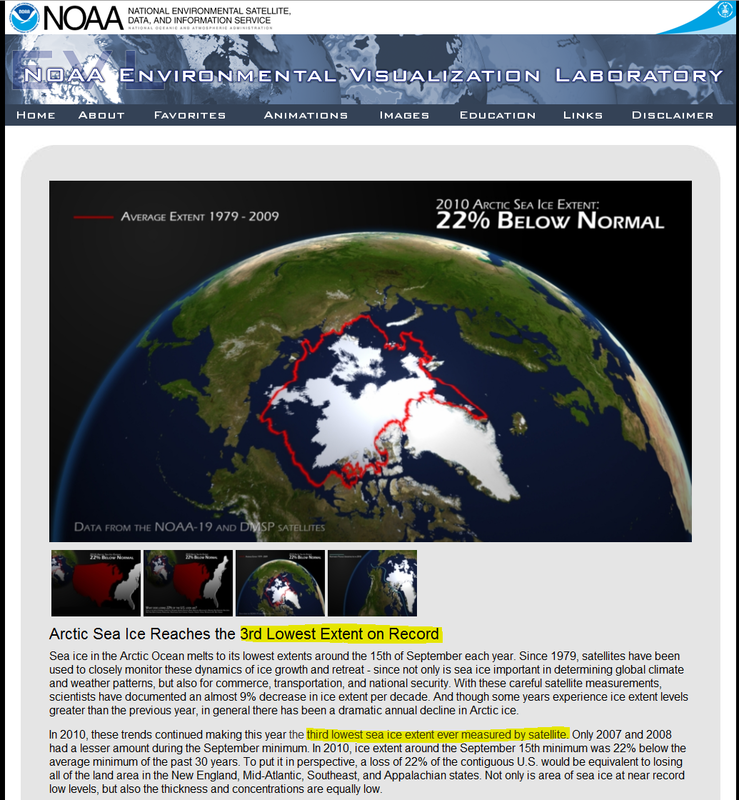 Joe Bastardi: Monday Morning Sea Ice Report Sep 20, 2010; 10:31 AM EDT. jakers me boi, what color is the sky in your world? Does asking a straightforward, 3-word question turn someone into a ‘stalker’ on your planet? 2009 was 5800 …. BUT my figures indicate the “rebound” La Nina in 2007 added 1200 & this VERY powerful rebound aought to add near DOUBLE that. (1) an El Nino like 2007’s melts over 5000 km3 & it is All Gone. Obviously I prefer #2, since I forecast 99% U.S. Deaths from #1 ! …. so IF I tell you to run: move to Brazil or die ! (maybe: Abrupt Climate Changes that “should” happen are still 50-50 according to the Abrupt Climate Change Task Force which, after all, was formed to dismiss the possibility and was not happy to find they were. Here: basically if the Arctic has NO ICE + SUN, it will become hotter than further South & the Currents reverse = Worse than that Disaster Movie). Anthony Watts: Walt Meir was NOT silent – – you need to get on the Sea Ice Outlook Mailing List. Walt Mieir was Very upset about the METOP satellite feed NOAA used for the PICTURE ABOVE. The whole thing is “experimental”, according to NOAA – – and that is the KINDEST word he had to say about it. To get an analogy: Pips has a display of the “raw” Concentration DATA that they wildly enhance the contrast on. “We’ve been in touch with them about this during the past week. Where they show no ice there is some reduced concentrations, but it is still at least 50% in the PM fields” – – the METOP Map cutoff is 25%. To put it charitably, Walt says they have the wrong contrast setting. You may have seen my Compendiums of 13-to-15 Indexes. Apparently, one reason Climate Scientists print few DATA lists is they fear the inevitable disaggreements between Numbers will excite Belief they are all LIARS. Actually he seemed surprised & pleased my Conclusion was that they all had a definitive Order – – like runners in their Lanes — and they STAYED in the Lanes (everyone has their own set of rules for interpretting the Satellite Data which is from measuring radiation coming UP at it, presumably reflected but not always – – thus the rules) … You are wrong to say, for instance, that PIPS is a model and others are not – – they all are, though PIPS Thickness is a 2-step process & so the problems are “squared” – – concentration maps give a percent of Ice, say, 50% ice in September, and then Pips applies a FIXED thickness as per the rulebook of 1987 – – which is why there is no trend ! PIOMAS is in fact the “improved” Pips, with actual measured Thickness (from ships & shore weathermen) in effect “calibrating” the rule for a year with thicker or thinner Ice. But is basically = PIPS, far from Shore or ships & PIOMAS broke its record of nearly Perfectly matching ICESAT when in 2007 the Center melted. Please note PIOMAS recorded 1300 more than ICESAT. If their Model favored Global Warming, they’d have recorded LESS than ICESAT’s “real” Volume. A recent set of Plane Flights presumably mean this last number – – or more likely the next – – may be Accurate even for the Center. So the Next Number may be VERY different. –>> Congratulations on the Pips Displacement PLUS thickness Map. The Atlantic Multidecadal Oscillation is reasonably closely correlated with the Arctic sea ice extent going back over 100 years. (There are several papers on this). There was a big switch in the Arctic sea ice about 1995 and this correlates with a large upswing in the AMO that year. In the middle of August this year, the AMO reached what it is probably its record level (going back 150 years). 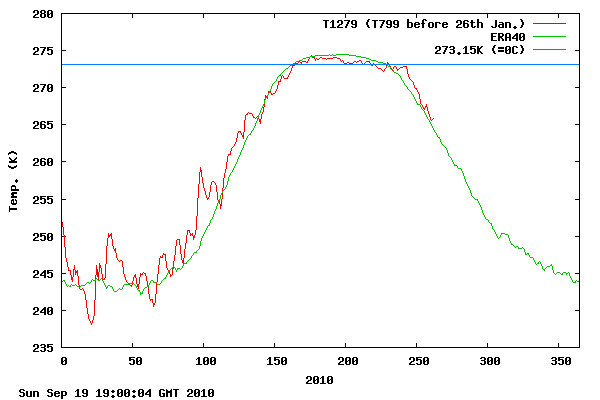 It has since declined by 0.26C (quite a bit) over the past 4 weeks. The AMO sometimes spikes about 8 months after the peak of an El Nino and it seems to have done this year. I believe this contributed to the decline in sea ice starting about late May when the AMO started its rapid increase. Here is where I believe the AMO is going over the next 6 months – down again driven by tropical storms releasing the heat and through the seconary effects of the current La Nina. And sometimes related to it, the ENSO over the next six months – a La Nina which which rival the record lowest levels around December this year. Very cold winter and spring coming in northern North America and the Arctic going by the historic climate correlations. Maybe the NSIDC shouldn’t have corrected anything. All Sea Ice Extents are receding (as well as Sea Ice Areas) globally since Sept 15th. Strange, though, as I can see a lot more sea ice in Google images of the Arctic than just 1 week ago. Like the Sea Ice is increasing the real world, but the data input to the graphs is being choked down. Now, what sort of extra-terrestrial event would do that to the satellites? Preliminary JAXA 15% Extent for 20th = 4,855,156, a gain of 13,593 on yesterday. Now 41,562 in hand, looking good! The Atlantic Multidecadal Oscillation is reasonably closely correlated with the Arctic sea ice extent going back over 100 years. And it is simply astounding that the Chicken Littles the “Ice is Melting” crowd never want to talk about the broad-reaching effects of the AMO. Listening to the balmy breezes strike the windchimes as Igor’s swells move in less than 200 meters away from the edge of a continent, I am reminded of this this early late September “summer” morning, of a very warm, WARM Atlantic. And you can take your ice-melt hand-wringing to the bank on that one. Come back with an study that covers the lifespan of a human, rather than one that cover’s the lifespan of a rat (i.e. 2002) and we’ll talk. There is simply NO emergency here. The Arctic is just doing what it has done for scores and hundreds and thousands and millions of years. Thank you for that. I hoped I was not the only one checking the output vs the actual images. What makes you so certain AGW has nothing to do with it? What makes you so certain that polar scientists have never taken this factor into account? If it is normal for the Arctic to change so fast, it must have happened many times before, and thus there should be a lot more clues. But it most probably isn’t normal. The globe has warmed…as it has done for many eons before our ancestors were swinging from trees. Catastrophic Anthropogenic Global Pollution vs. CAGW. The former, plausible. The latter, complete foolishness. Ummm….who said I was talking about “polar scientists” many of whom I hold in high regard [OK Mark Serreze is not one of them….but Meier is]. I was talking about the chicken little death spiral scaremongers. To use the term “polar scientists” is your term, not mine. Who said it was “normal”? And for the record, “what is normal?? All of climate and weather history is jagged spikes of “abnormality”. I went running this morning in a set of hills on the coastal plain where no hills should be. It is not “normal” for some ancient sea boundary of sand dunes to become forested hills 5,000 years later, but they did. We have just been lucky as a species to not be hit by a major asteroid, buried by a supervolcano, or even destroyed by our own inventions, in our short 200,000 year day in the sun on this ancient Earth. We have risen in our evolution from being tree-swinging brutes, to skyscraper-building geniuses, in such a short time. Suffice it to say it is because of the generally tranquil state of Mother Earth during that time. That may not be the case in the future. But the “normal” that you speak about….when you look against the means of time itself, is FAR from normal. We have just been lucky. I am currently preparing Part 2 which covers the well documented (but apparently forgotten) episode betwen 1920-1940. Part three will cover the numerous other periods of melt of which the Vikings 1000 years ago and the Ipiatuk 2000 years ago are the most famous. Preliminary JAXA 15% Extent for 20th = 4,855,156, a gain of 13,593 on yesterday. Meanwhile sitting here at 322 am eastern time My JAXA site is still stuck on the 19th..How do you get your updates faster? Also there was a link posted earlier by “steve from rockwood” to an article about the Ice flush which stated at one point that back in 07 the Usual Ice Damming/Jamming of the Nares Strait did not happen which alowed the ice to flow out freely. That clarified my thinking & earlier post I made on the the effects of thin ice on ice Jamming. I guess history books are of some dubious value to other historians. My god, 2010 looks like having the 29th highest minimum of Arctic ice… ever on record! Of course “ever on record” has a slightly different meaning to “ever”. But let’s not quibble over mere words when the earth seems set to freeze over. I did a recount. 2010 is only the thirtieth highest ice minimum ever on record. Still pretty scary though. I mean, that’s EVER on record. UXBRIDGE, Canada, Sep 20, 2010 (IPS) – The carbon dioxide emissions from burning fossil fuels have melted the Arctic sea ice to its lowest volume since before the rise of human civilisation, dangerously upsetting the energy balance of the entire planet, climate scientists are reporting. “The Arctic sea ice has reached its four lowest summer extents (area covered) in the last four years,” said Mark Serreze, director of the National Snow and Ice Data Center in the U.S. city of Boulder, Colorado. The volume – extent and thickness – of ice left in the Arctic likely reached the lowest ever level this month, Serreze told IPS. “I stand by my previous statements that the Arctic summer sea ice cover is in a death spiral. It’s not going to recover,” he said. Serreze is at it again. Really, if those satellites are right it should have been possible to sail the Northeast passage and the Northwest Passage this summer. Guess what 2 yachts are on the verge of completing sailing through both in the same summer, both having passed through the normally treacherous Bellot strait within the last couple of days. He meant to say lowest satellite-recorded level. But when you’re talking to the MSM, you have to eliminate all that complicated stuff and talk from the gut. So thirty-two years become thirty-two million years, more or less. Same ballpark. It’s about reaching hearts and minds. There’s certainly been a radical change in the Arctic since 1922. Back then, there wasn’t an activist yachtsman in sight when the ice thinned out. Lousy, superficial flapper-era! They definitely needed the icebreakers and helis for the surveying work, but apparently not for the Straits that year. Confirmed JAXA 15% extent for Sept 20th: 4878281. A gain of 36718. Now 64687 above the minimum reached on the 18th. JAXA’s processing seems to be done at the University of Alaska in Fairbanks. The file times shown are Fairbanks local time, Watch these and you’ll quickly figure out when they’re refreshed (if I remember correctly, usually a few minutes after 19:00 for preliminaries and 06:00 the following day for confirmed). The file plot.csv contains the latest data. Yeah that was the year that Wrangel Island was so surrounded by ice that a support vessel couldn’t reach and the Canadian party couldn’t be relieved until 1923 when only one of them survived. Neither could the Russians, anxious to protect their sovereignty were also unable to reach the island because of the ice. So you’re right, there has been a radical change since then, there’s much less ice now! Or you could look for more data. So major Arctic warming has happened before in pre-SUV, low-CO2 times. Thanx for confirming natural climate variability. I think it would be fair to compare pips and piomas predictions before the dmi 80n temperatures went below the freezing point of salt water after this thickness of ice didn’t really matter. The index of refraction for ice and water are very close to the same (both right at 1.3 compared to air.) The difference for heating the Arctic if ice-coverd and not already melted is claimed to the abosrbtion of the “darker water” compared to ice. 1) If so, how high above the horizon (what angle) does the sun need to be before heating (absorption into the surface and not reflection) actually begins if both have the same index? 2) In more temperate latitudes, that is, in latitudes where there is much less atmosphere to go through, there is little effective power from solar cells before 9:00 AM local solar time (nor after 3:00 PM solar time) due to atmospheric losses. Too much cold energy left the area to give record cold to South America? Back to the northern hemisphere…The link Ed Murphy posted showing Hurricane Igor going up into the Canadian Maritimes will turn Igor into a Snowycane & take care of some of that red you see up above hudson bay & then by this weekend you should be able to see the ground white along the coast on the Barrow ice cam so as you can see the Snow extent is getting a great start! The Wrangel Island I’ve heard about was visited numerous times in the last two centuries. By ships, not pixies. It was even one of those floating things that effected the 1923 Blackjack rescue. Of course, many times ships got stuck. The Russians found access and supply much harder after their 1926 mini-settlement, which had been helped by clear waters. But at least the place had its own corrupt commie governor by the thirties. That’s something that should appeal to fans of the IPCC. So, fans of the IPCC = corrupt commie lovers? Hell, there were crocodiles in the Eocene Arctic. Do you think that somehow disproves anthropogenic effects now? So that kind of change would require a growth in area 234000 km^2 more than the record, and nearly twice as much as the second-largest growth. If that kind of growth doesn’t impress you, nothing will. On the other hand, I’m surprised I haven’t seen more skeptics championing the 2009 area increase considering it was the third-largest single-season increase on record. I agree with you here. Except not based on the “accelerating rate of loss each melt season”, but on the above numbers. Even reaching 5.5 e6 km^2 extent would require the 3rd largest increase on record. It certainly doesn’t help your case. I should point out once again that skeptics have nothing to prove. The promoters of the CO2=CAGW hypothesis have the burden of providing empirical, testable evidence, showing convincingly that the one CO2 molecule out of every 34 that constitutes human emissions is causing a specific temperature rise. Or, they can try to perfect a climate model that can reliably predict future climate. The promoters of the CO2=CAGW hypothesis have been unable to do either of those things. Furthermore, they cannot show that the current climate is anything out of the ordinary, as my post at 12:39 pm reiterates. Thus they are unable to falsify the null hypothesis: that the observed temperature changes are a result of natural variability. Either we follow the scientific method, or it all becomes Lysenkoism. Preliminary JAXA 15% Extent for 21st = 4,901,406 a gain of 23, 125 on yesterday. Now 87, 812 in hand, still looking good! Posts like this give the impression that you don’t read any of the science, just web sites that support your views. After today’s preliminary extent, I’ll throw in the towel and say we’ve reached the minimum. I was a holdout on the early Sept apparent minimum, but this one looks to be pretty much in the books. I’m just glad I said the minimum would fall in the 18th-21st timespan before the 18th’s preliminary number was up. However, I did guess 4.79e6 km^2 for the value, so I was low even guessing just a day before the minimum, LOL. If one were trying to detect changes in temperature that were largely independent of yearly and daily cycles, I think a 24 hour moving average of an 8766 hr (approximate solar year) moving average of the observed hourly data might do the trick. The dual averaging here is because the solar year is not an integer number of days. I really doubt that anybody would ever actually bother to do this. Typical, you wait years and years for an Arctic circumnavigation yacht to come along and then two come at once. Looks like both will do it this year, bravo! Not sure who is likely to win, presumably the trimaran is quicker now they are approaching open water? Also, for a pure circumnavigation they would have to reach the place they started from, so the Norwegians are closer to home. I made my guess on the 19th after the 18th revised number was up, but before the 19th prelim number was up showing a gain. PIOMAS changed its big chart back (dated Spt 20) to 8-31 but its little chart still shows the mini-reversal for 9-15. … also changed the text to suggest Updates every 2 weeks or longer (was: 3 to 5 days). This is a key idea on criteria for “recovery.” Ice extent and area have been trending downwards for decades, and recently at a steepening rate. Around this trend there remains much annual variation, so that one year might go up, the next down, compared with the year before. Being somewhat higher than the year before, however, no longer takes us anywhere near the average of even one decade ago. The reason that the 2007 decline drew so much scientific attention is that it was the largest one-year change on record, and outside the range of previously observed year-to-year variation. The reason that the 2008 or 2009 increases appeared less impressive to most scientists is that they were not exceptional, but well within the observed range of interannual variation — around that downward-sloping trend. The general point makes sense, that a rapid increase toward the last decade’s mean is physically unlikely. The numbers here don’t work as an argument against Gandalf, though, because Gandalf referred to extent. If extent reached 5.75 in 2011, Gandalf is correct that should not be impressive. It’s well within the bounds of interannual variation around a downward trend. Confirmed JAXA 15% extent for Sept 21st: 4915313. A gain of 37032. Now 101719 above the minimum reached on the 18th. All over bar the shouting it seems. If extent reached 5.75 in 2011, Gandalf is correct that should not be impressive. It’s well within the bounds of interannual variation around a downward trend. I don’t have numbers for extent before 2002, when the JAXA record starts. Do you have a link where I can get these numbers? I want some sort of data confirmation to backup your claim that a single-year increase of 936406 km^2 is well within the bounds of interannual variation, where it might be in the 1979-2001 data that I don’t have (thus why I based my argument around area and an extent-to-area correlation). Currently, the record single-year increase in JAXA is 542031 km^2 (2008-2009), so to beat the current record by a whopping 73% is pretty hard to spin as anything other than impressive. If you have pre-2002 data showing this conclusion to be in error, please provide it. I completely agree that 5.75 e6 km^2 is more than likely not going to happen. However, I disagree that if it did happen that it wouldn’t be impressive, we’re talking a record level of growth here (again, to the best I can calculate with the data I have access to), and it would exhibit a one-year minimum extent increase of nearly 20%. Your claim is that 5.75 wouldn’t be impressive because it’s still well below 7.0 million. I’m claiming the exact opposite – 5.75 million would be ridiculously impressive because it would need the largest single-year growth in the satellite history. The problem here is that the sea ice does not _grow_ to the minimum. It shrinks from a much larger value, attaining and then descending below higher value as it does so. Therefore, it would not be so hard for a slower shrinkage to stop at 5.75m. Yeah, so for a short time they could do what is common and surpassed today, in one small area (the Greenland Sea), and that’s the best argument there is that this is just a recurrence of unknowable-cause natural climate variability? That’s it. The Norwegians and Russians sailed both Passages in one single season. Never before done in the history of humankind (or perhaps tonyb can surprise me). All thanks to you, you and you (and me). It is, unfortunately, the dramatic changes in Arctic sea ice conditions in recent years that have made this trip possible. On the time of Roald Amundsen it took five to six years to complete the same distance, due to the extremely difficult and demanding ice conditions. Now we have proven that it is possible to make the voyage in a 31-foot fibreglass sailing boat, equipped with a 10 horsepower outboard motor for emergencies. This shows how dramatic and how fast these changes are happening. The changes that we are witnessing will influence climate on a global scale, in addition to the whole range of animal life in the Arctic – especially seals and polar bears, whose lives are dependent on the sea ice. It is our hope that our voyage will be seen as a strong, visible symbol of the scale and the speed of these changes. It is a huge milestone for us to have completed both passages, and the second phase of the expedition. However, our journey is not over yet; now we will start on the final leg back home to Oslo, to complete our circumnavigation of the Arctic. You can congratulate them here. The problem here is that the sea ice does not _grow_ to the minimum. It shrinks from a much larger value, attaining and then descending below higher value as it does so. Okay, so change my word “growth” to “increase”. And the approach your putting forth seems to pretty much throw effects from previous years out the window. Is consideration of multi-year ice worthless then? Sometimes I think it’s over-emphasized, but I think it definitely has merit. I argue that the previous year’s minimum is a more important reference point (and the one I’m using) than the previous winter’s maximum (the one you’re claiming). As evidence of this, I checked the correlation coefficients for 1980-2010 for minima with respect to maxima the previous winter and also with respect to minima the previous year (using CT’s area data). Previous winter maximum’s R^2 = 0.477. Previous year’s minimum = 0.659. Looks like evaluating the increase over the previous year’s minimum is reasonable after all. Therefore, it would not be so hard for a slower shrinkage to stop at 5.75m. What normal, natural mechanism do you propose to gain a million km^2 in one year? You must have one since it should be “not so hard”. Why have we not seen this often in the past (can’t use long-term decline excuse here, this is about year-to-year fluctuations)? From what I’ve seen, most anomalous weather events decrease extent, not increase it (I’m not saying clouds and proper winds can’t help the final extent, it’s just that there doesn’t seem to be mechanims to cause severe gains like there are methods for severe loss, such as severe winds pushing ice southward) . I see the year-to-year ice fluctuations being like the speed of average traffic on a highway. If the normal speed is 70 mph, no one is surprised to see it drop one day to 30-40 mph because there are tons of mechanisms for this (a wreck, traffic jam, construction, bad weather, etc), but people would be shocked to see the average speed at 100-110 mph one day. Why? Because there are no reasonable mechanisms. And no, I don’t believe the long term drop in ice is from short-term weather events. That argument would be a red herring because I’m talking about year-to-year changes, not the long term decline. Well I predicted (on the 17th) 4.878E6 km^2 for the 18th, all my estimates (going back ~3 months) called for the minimum to occur on the 19th, so I missed the actual JAXA minimum by one whole day. Over the past two months (61 days) of weekly estimates, the resulting RMS error was 148K km^2, while the average was 4.783E6 km^2 (~0.63% below the actual JAXA minimum). So, I’m quit pleased and somewhat surprised, that the statistical approach I chose (pivot updating with a 15-day least squares moving average of the daily melt losses), appears to have some skill over the last two months of the (current) melt season. The Norwegians and Russians sailed both Passages in one single season. And you don’t think it might have become possible because of GPS and real-time knowledge of the whereabouts of the ice? Nansen probably hardly knew where he was from one day to the next, let alone where the ice was and how many tenths there were and of what age and thickness. Will not happen, as of today’s NSIDC chart, the revised numbers for the past two days, both moved up by ~2.5 pixels, and today’s value is 1.5 pixels above yesterday’s value. If it is truly a 5-day (centered) moving average, then 9/19 is set at ~4.6E6 km^2. In another ~2 days we’ll know pretty much if the 19th, 20th, or 21th is the actual minimum. My current best estimate for NSIDC’s September monthly average extent is 4.77E6 km^2. Thanx again for confirming natural climate variability. However, you have your “short time” periods confused. The actual “short time” is the 1979 – 2010 satellite record. I was just about to dash off a note that NSIDC went down — which it did — but, as you say, the revision UP of the 20th meant even the drop on the 21st, put it further behind than before. … more important seems the Central Arctic Basin at Cryo, which had added 250,000 km3, just dropped 71 K. Is this a Leading Indicator ? >>> The Ex-Hurricanes Approach: What will they do ??? Preliminary JAXA 15% Extent for 22nd = 4,954,844 a gain of 39, 531 on yesterday. Now 141, 250 in hand, a done deal. Hopefully I’ll learn and do better next year. “That’s it. The Norwegians and Russians sailed both Passages in one single season. Never before done in the history of humankind (or perhaps tonyb can surprise me). All thanks to you, you and you (and me). An amazing achievement without the use of modern navigational aids. Ooops wait a moment!! They did have modern naviagtional aids. I wonder if Roald Amundsen would have taken 3 years if he had access to those same aids? Different achievements, different eras. Both to be admired but hardly relevant to the long term future of the Arctic Ice. I’m thinking more luck than skill. As the method calculates the mean trend line curve (N = 7 for 2003-2009) and the standard deviation of the of the trend line slopes. I had to pick (and stick with) a muliple of the standard deviation (or even a fractional amount) , and I chose -1 (thinking I’d be a little bit conservative as the daily loses are less than the mean loses (sigma 0)) column. I need to do exactly what you suggest (I already knew I needed to do this (where N =7 (2003-2010 minus the year in question), or just go with N = 8 and redo this year plus all other years (much easier to do it this way)). Next year I’ll also be using the UIUC area data as well as the PIOMAS model data (for the JAXA era). the Arctic sea ice has significant inertia (IMHO when an extreme event occurs), in that the 2007 minimum resulted in a large ice volume loss, that is still affecting the seasonal minimum three years later. Based on his account of the journey he certainly would have, navigation didn’t seem to be a problem. 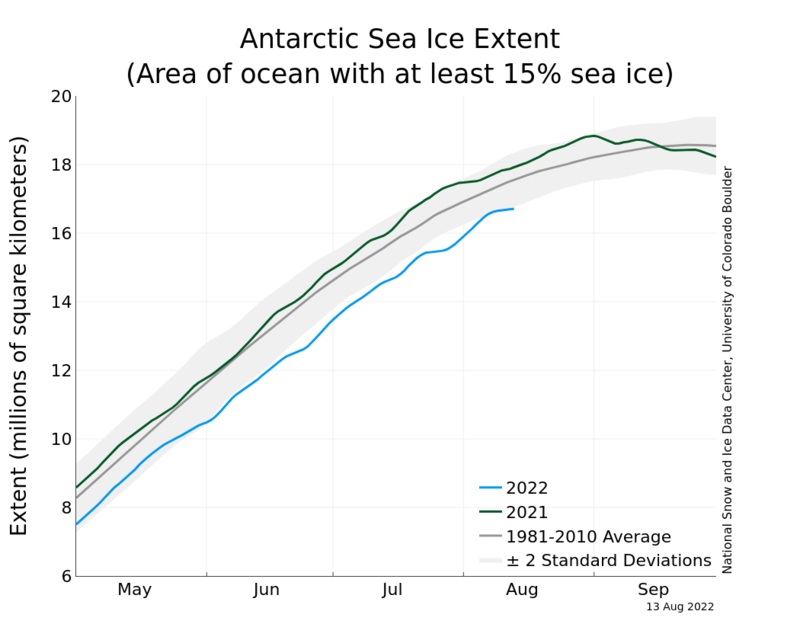 The sea ice in Antarctica is plummeting, leading to perhaps the lowest global sea ice area anomaly. Has the Bastardi/Goddard theory of Arctic sea ice loss being compensated by Antarctic sea ice gain been invalidated so soon? Is it a sensor malfunctioning? WUWT, the no 1 news outlet with regards to Antarctic sea ice is not reporting on this, WUWT? NSIDC also has an interesting graph. Useful link to demonstrate the development of Sea Ice. This is a photo of “rotten ice”. Yes mr. kirschbaum, I had the same question 2 days ago but no response. The “lobe” everyone was so worried about has surrounding air temps between 12 & 24 degrees & everywhere else is good & cold except a small area poking up towards Svalbard,Norway.. & on the other side from the Bering Strait side of AK poking up due north outwards to about 77 north….all systems Go!! That is a very large drop in Antarctic ice area. The global value is now low if there are no sensor problems. Will be interesting to watch. Well done to both boats that have done the Northern and NW Passages this year. There was so little ice it seems they didn’t even have to wait for leads to open up etc. Ok, last post from yours truly, until SIN #24 (kind of like that acronym for some odd reason). 1) NSIDC will update the date of the minimum to the 19th at right around 4.60E6 km^2 (based off of today’s chart). 2) NSIDC will announce (in the early October time frame) the 2010 September monthly median Arctic sea ice extent as being right around 4.80E6 km^2 (based off of several different methods using NSIDC and JAXA data 2002-2010 inclusive). Is this the 1st oficial sea level snow in the us? Latest IJIS extent at 5,116,875 km2, up 350,000 km2 from the minimum, just a week ago. Since 2002, only 2004 has seen a larger gain (360,000 km2) over the same period (18th-25th Sept). The ex-Hurricanes seem to have formed a Club, lining the Canada/Greenland South Shore of the Arctic Ocean. ?? Afraid to get their toes in the Water ?? Long-Range Forecasts at WetterCentrale say they’ll make a BIG LOW covering the Central Arctic – – like lasted all of July. Ships still report melting in the West — water still Hot – – but it is being overwhelmed. By a LOT. Last minimums recorded were probably both Topaz extents, which only turned up on the 23rd. LOWEST = 1 Volume (3900 km3 to 4850=2007, 6000=2008, 5800=2009). This is a clear Progression: Volume to Area to Extent: this implies 2010 had Record Least Ice Quantity – – the unusual Wind pattern spread it out more. PS: 5 indexes cannot be rated as had no record for 2008 (TOPAZ, NANSEN). Hamburg updated to the 17th (bi-monthly) so still not final there. Next Year ? as the La Nina (cold) is SO strong, I’d expect a proportional increase in volume = twice or more 2008’s gain. That would imply a net Gain over the 2007/08 Dip & Rebound pair. 2010 might then become the 60-year Minimum ? ? Hmmm.